Oatmeal Cookies are one of my families most favorite treats. Don't get me wrong, we love lots of different kinds of cookies, but oatmeal is really up there at the top of the list. I've made Raisinette Oatmeal Cookies, Oatmeal Cookie Bars, Oatmeal Peanut Butter Cookies, Thin, Chewy & Buttery Oatmeal Cookies, Oatmeal Chocolate Chip Cookie Pizza, Chocolate Oatmeal Bars, Giant Oatmeal Chocolate Chip Cookies, andGood Ole Original Oatmeal Chocolate Chip Cookies, phew! The list could go on and on. Just when I thought there can't possibly be another kind of oatmeal cookie that I haven't made.....I think about Chocolate Oatmeal cookies and because if one dose of chocolate is good, two or even three is better right? So I start concocting a recipe, a bit from this recipe, a bit from another until I have Double Chocolate Chip Oatmeal Cookies and I want to make them immediately but I wait. I knew I had to wait. I waited for a snow storm, which doesn't take very long in February in Rhode Island and last week we got over a foot of snow and I knew I was going to make soup and I knew I was going to make these cookies. 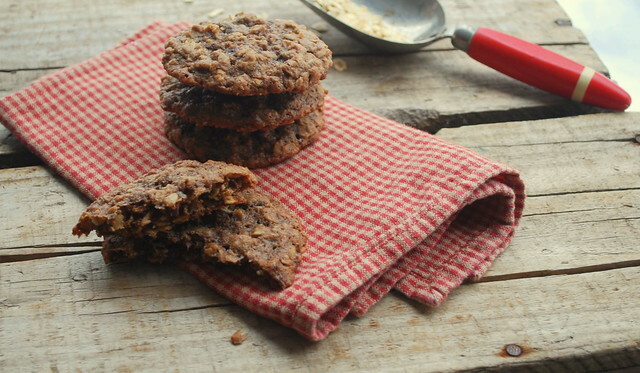 Snowy days are just meant for oatmeal cookies and when they are loaded with chocolate chips and cocoa powder and some espresso powder it takes the little ordinary oatmeal cookie and sends it over the top! Preheat oven to 350F. Line a few baking sheet with parchment and set aside. I alternate with 3 baking sheets when I'm making cookies. One for cooling cookies, one in the oven and a third to rotate so I am never putting cookie dough on warm cookie sheet. In a large bowl, mix softened butter and sugar with a hand mixer on medium speed until creamy. Add in eggs and vanilla and mix it well. In a separate bowl whisk together the flour, cocoa powder, espresso powder (if you are using it) soda, and salt. Add the dry mixture to the wet. Mix until just combined. Mixture will be thick. Fold in oatmeal using a heavy wooden spoon or large spatula, again, this batter is what I call spoon-breaking batter so make sure you are using a strong stirrer. Add in the chocolate chips and mix until just combined. Use a cookie scoop or drop by rounded tablespoon on the baking sheet. Bake for 11- 13 minutes. Mine we perfect at 13 minutes. Don’t over bake! Remove from oven and let them sit on the baking sheet for about 3 minutes. Transfer to a rack to cool completely.